How do you evaluate the learning process? Some schools have decided to adopt different words to describe children’s progress during the academic year. “Emerging, Beginning, beginning + …” are just a simple example. They can also adopt the word “exceeding” to describe a child that has achieved all the assessment criteria expected for the year although that is what is expected! But how can I report to the school community after the Government’s initiative of abolishing “levels”? Shall we use this language or we rather use a % of a total that does not imply any meaning attached to the word? Labelling someone “emerging” does it mean that was always exposed to knowledge but did not grasp any concept? Why changing something that used to work quite well: “Below national expectations, at national expectations…” (and parents / society totally understood)? or is it because we do not know what national expectations are anymore..? If we compare now and before, we can find lots of similarities in the use of the language to identify a “level” or the amount of knowledge learnt. I personally think that It is still exactly the same but with a different name! We can use numbers, colours, %, levels, measures, quantities… but at the end we will have to benchmark and compare. 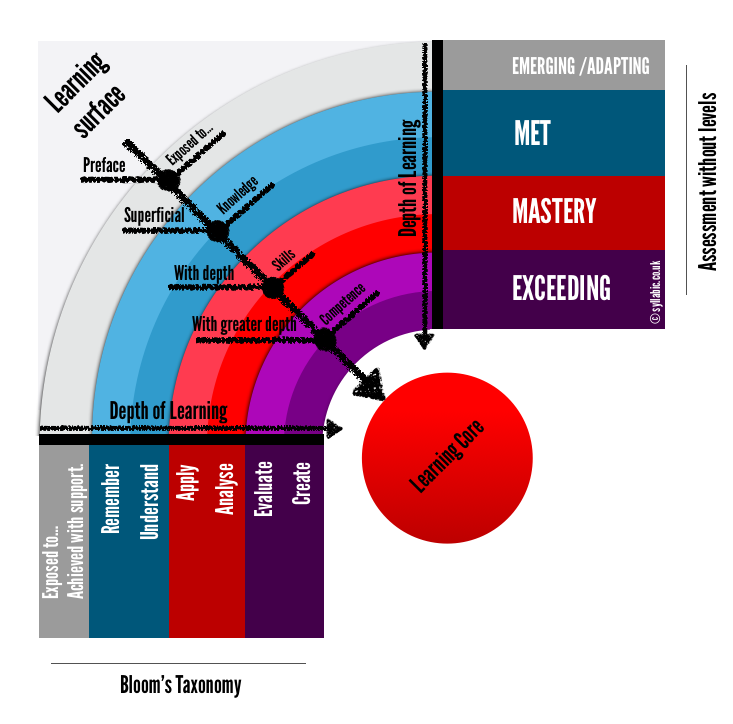 Are we talking about learning over time (long-term) or depth of learning (concept)? We need to make it clear and don’t get messed up with the use of language. There are different ways of analysing the depth of learning but using the taxonomy could decrease the effort. Taxonomy is simply a classification. In some ways, very efficient to classify different depth of learning especially to organise the level of questioning and tasks. The illustration below is a revision of the cognitive domain from Bloom’s taxonomy to illustrate the depth of learning and how this could be measured. This can be used with every learning concept at a specific time during his learning.